Lottery players use a lot of tactics or systems in choosing the numbers they pin their hopes of riches on. Some use numbers gleaned from horoscope predictions, significant dates, birthdays, numbers from fortune cookies, and even numbers which appear on their dreams. Some of them win, but a taxi driver from Cambridgeshire won a £215,000 Euromillions prize because of an error. Murray McKenzie used a combination containing what was supposed to be a number forming part of his son’s birthday; but the number he used was one day out. 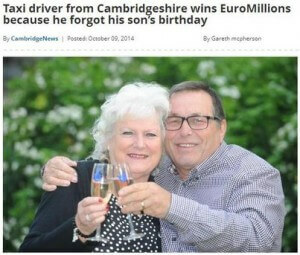 Though embarrassed that he did not remember his son’s birthday, he and his wife are happy with the result. Though McKenzie has not planned for any major acquisitions, he has indicated he would enjoy less pressure on the pedal.